In the history of NCAA March Madness, a #5 seed has never won the championship. #5 seeds have made it to the Final Four 7 times, and lost in the Championship game 3 times (most recently Butler vs. Duke). This year’s NCAA Tournament saw #5 seeds take a nose-dive, with only 1 of the 4 (VCU) making it out of the first round. Luckily, there’s ChoLon Bistro to pick up the slack for #5 seeds. We’ve already spent a great deal of time extolling the virtues of the Cho Burger to the masses (which can be found here, here, and here), but now it’s up against it’s stiffest competition in Park Burger. Like the consummate #1 seed, Park Burger coasted their way into the Final Four, dispatching of Griff’s, Jack-n-Grill, and even City Grille with relative ease. Is this the year when the Butler/VCU of the Denver Burger Bracket win that Final Four match-up, or will the higher seed reign supreme and make Cinderella turn into the George Mason of the tournament? Let’s find out. I’ve been to Park Burger now 5 times. Each time, I’ve found gotten a different burger, and each time I’ve come away impressed. They’ve got some outrageously good but scarce chef specials each month, but their main lineup of specialty combinations is the best I’ve ever seen. From the classic Royale (caramelized onions, blue cheese, bacon) to the crowd pleaser El Chilago (cheddar, jalapenos, and guacamole), Park Burger does not disappoint. They’ve even got a burger for New Yorkers (topped with sauerkraut, swiss cheese, corned beef, and 1000 island dressing) and my new favorite, the Scarpone (provolone, giardiniera, truffled garlic aioli, and crispy pancetta). You could order with your eyes closed and your finger pointing at the menu and be perfectly satisfied. You can taste the freshness and high quality ingredients in every bite. They use 1/3 lb. patties of Angus beef from Harris Ranch that’s never been frozen, and the bright colors from the rest of the cheeses and veggies used just scream “fresh”. I’ve been impressed with every visit, and just know that I’ll continue to be impressed with each future visit to Park Burger. 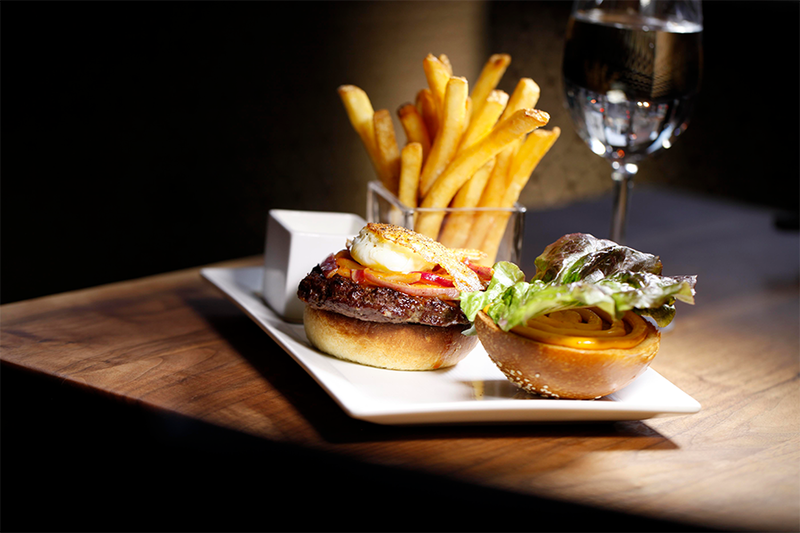 The Cinderella of the Denver Burger Bracket, ChoLon Bistro went from restaurant burger afterthought to darling of the tournament in just one bite. It’s extremely hard to make a dish TASTE like a completely different dish, and especially hard when the first dish is a burger. But Chef Lon at ChoLon manages to make his Cho Burger taste like a mix between a great dumpling and a bowl of delicious ramen, all between two buns. The burger meat is Angus as well, and the 63 degree egg has a richness that pairs perfectly with Korean kimchi style onions. They have an Asian sauce that I can’t even describe that pulls the whole burger together, and the house-made bun with black sesame seeds on top is fluffy and holds up nicely to all of the dripping juices. With some many great options on their menu, the Cho Burger can easily be overlooked, but we’re here to tell you, it’s one of the best in Denver. When faced with an impossible choice between two fantastic burgers, we’re only left with a gut feeling. We’ve already told you that they’re both great, and that we’d happily eat either one of them when faced with a burger craving. But the winner came down to which burger passed the scientific “first reaction” & “inner feeling” tests. 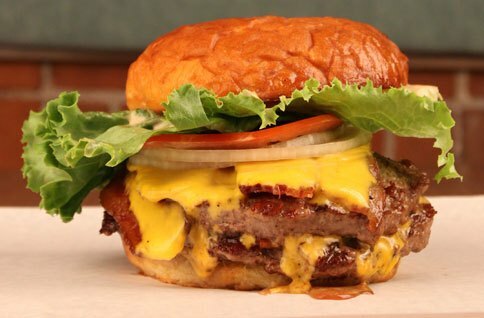 When it came to choosing a winner to face Highland Tap and Burger in the Championship match-up, we chose the burger that immediately came to our minds when asked, “Where do you wanna go tonight for a burger?” In the end, Park Burger shows its class and is on to the Championship in the Denver Burger Bracket.